Hamas-run "health ministry" says two killed by Israeli fire as "March of the Return" border riots continue. 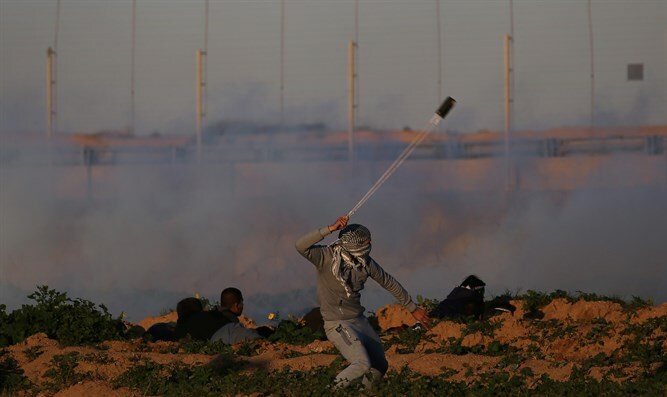 Two Gazans were killed by Israeli fire in renewed clashes along the Gaza border Friday, the Hamas-run “health ministry” in the enclave said, according to AFP. The IDF did not comment on the deaths but said "approximately 9,500 rioters and demonstrators" gathered in various locations, "hurling explosive devices, hard objects and rocks" at troops. Troops were "firing in accordance with standard operating procedures," an IDF spokeswoman said. Hamas openly admitted that most of the Gazans who have been killed in the border riots were members of the group.